During the summer school holidays, school prefect and College Vice Captain Lukas Kalos attended the National Gallery Of Australia’s Summer Scholarship program. Lukas won the coveted place in the scholarship program after submitting a portfolio of written and artistic response to the Gallery. 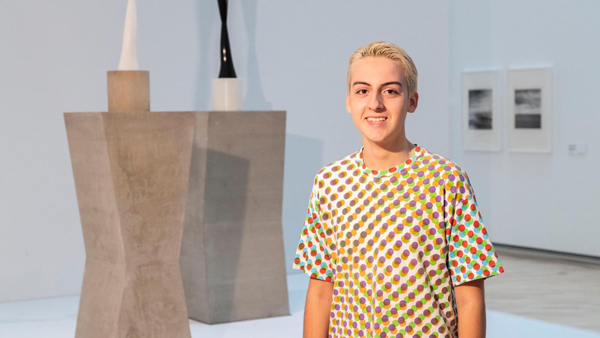 He was chosen to be one of only 16 students from across Australia to participate in the program, which offered an all-expenses paid trip including flights, accommodation, meals, Gallery workshops and personal instruction from some of Australia’s top contemporary artists. Lukas had to personally respond to the work of Rosetsky using a Silver Gelatin double exposure photograph as inspiration. Lukas responded with a work that spoke eloquently about the ties that are the foundation of our families and communities; how those ties not only bind us together but hold us apart and even thwart our future growth. Yet we also tie ourselves together as we drift through making family memories, interweaving our thoughts, feelings and experiences in rich and rewarding ways. Over the week, Lukas was able to refine his artistic skills with artist David Rosetsky, famous for his subliminal works on the themes of family and discourse. The scholarship is a magnificent opportunity to meet and create with peers from around the country, as well as fellow artists and curators. It exposes the students to the variety of employment opportunities offered to Visual Arts students and creates meaningful contacts for future development in their respective fields. Both the Betty Churcher Foundation and Fairfax Media finance and back the program, proving just how important the creative future of our students has become. Lukas will be using the resources and skills developed within the program to further refine his future Visual Arts Body of Work. Well done Lukas!